Today we planned on a return to Mt Rainier. Only this time, Julie would accompany me. 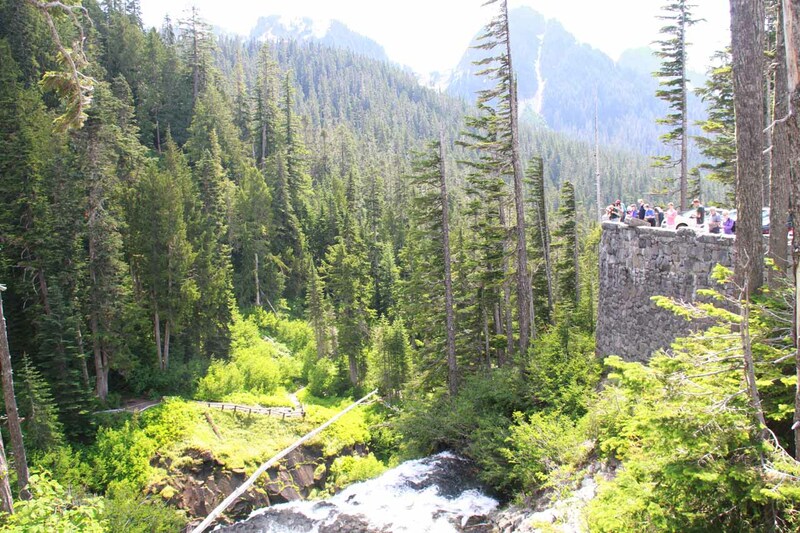 But since we were going to the more developed side of Mt Rainier (i.e. its south side at Paradise), we had a lot on our plate and an early start was imperative. So when I awoke unaided at 5:30am, I made it a point to get up as well as let Julie know that it was time to pump (just like on a normal weekday at home, which she would do at 5:30am right around the time when I’d leave for work). So it wasn’t a stretch to get that done and then be ready to go by 7am. Sure enough by 7am, we had our packs all stocked with bottled water, fruits, and some munchos. Plus, we had leftover piroshkis (basically Russian version of meat pies) and croissants for brekkie. Then, we headed out leaving Tahia with Julie’s mom for the day. The skies were mostly clear when we looked everywhere but southbound. 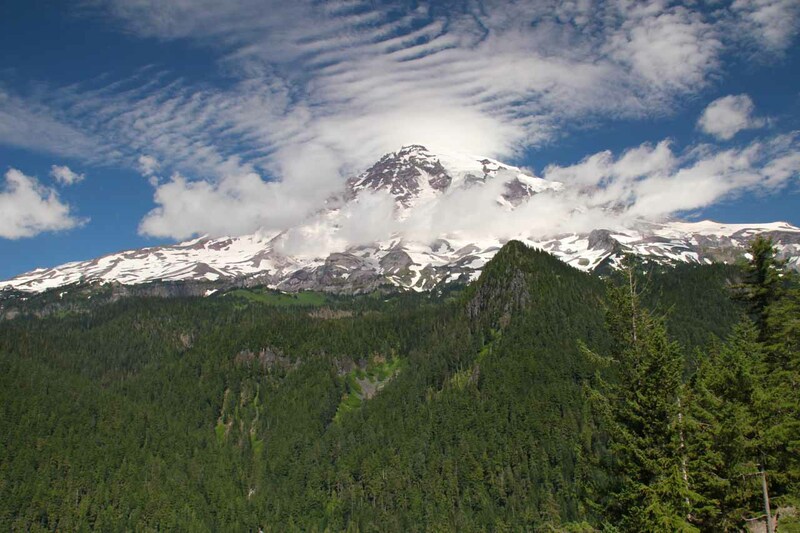 However, when we looked to the south, we were a little disheartened to see clouds covering Mt Rainier even though we could see most of its peak through the gray. 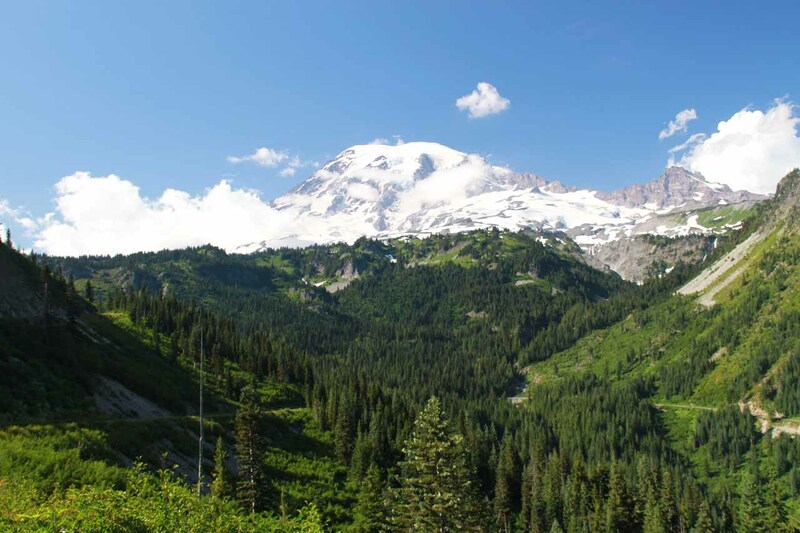 Since I had done most of this drive yesterday when I went solo to Mowich Lake, having Julie with me as we headed south towards Puyallup, then South Hills, and then to the south face of Rainier was fairly straightforward. 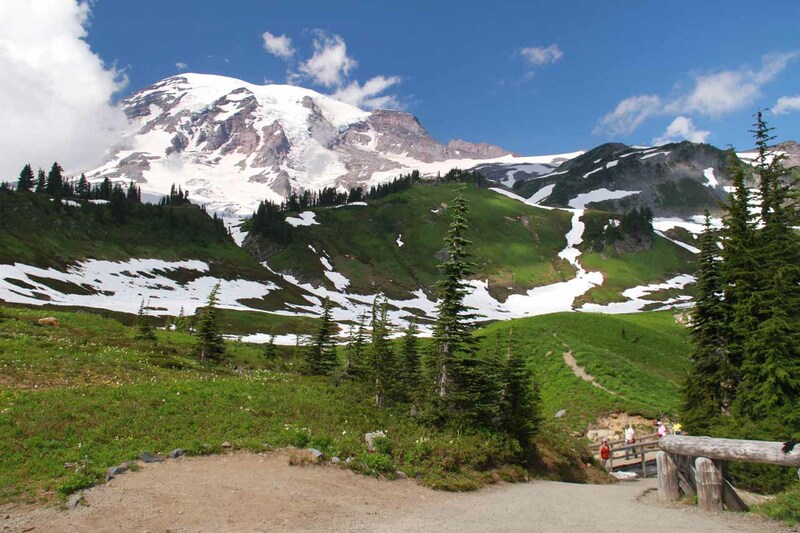 The only thing that caught me off guard was that there was no dedicated highway or throughfare leading to this touristy side of Mt Rainier National Park (at least if you’re coming from Seattle). 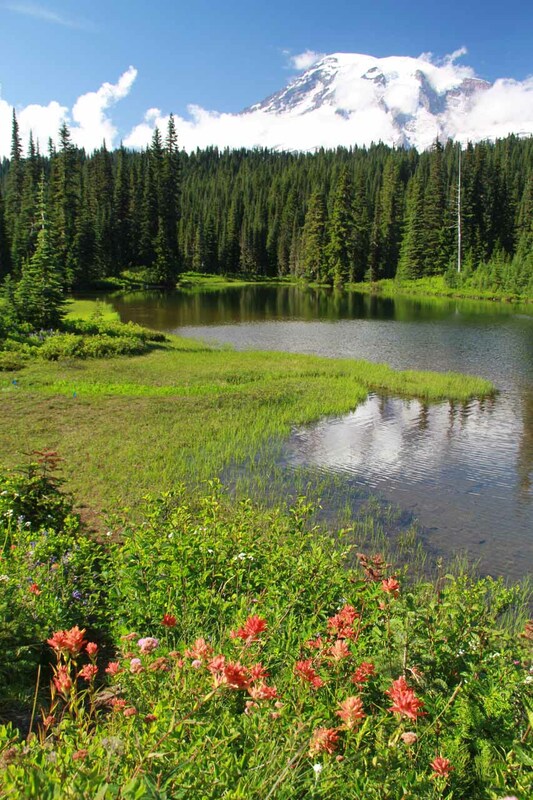 Instead, we had to traverse through a couple of suburbs and long stretches of traffic lights and surface streets before even getting onto forest service land, and then national park land. It was barely 60 miles from Seattle to Paradise, but it would still take over two hours to do the drive, and I’d bet most of the slow down was due to all the suburban surface streets before the mountain driving, which was pretty benign compared to some of the national forest roads we had driven on in the past (like Sequoia National Forest or even Sequoia National Park). Anyways, we made it into the park boundaries just before 9am and we managed to overshoot the trailhead parking for Comet Falls. But as we were looking for a place to turn around, we stumbled upon a pullout for the signposted Christie Falls! This was an attractive waterfall in that it had a bridge arched over its lowest tier. There were also additional tiers above the road bridge, which I had to walk on the road shoulder to get to the narrow bridge and take my shots. 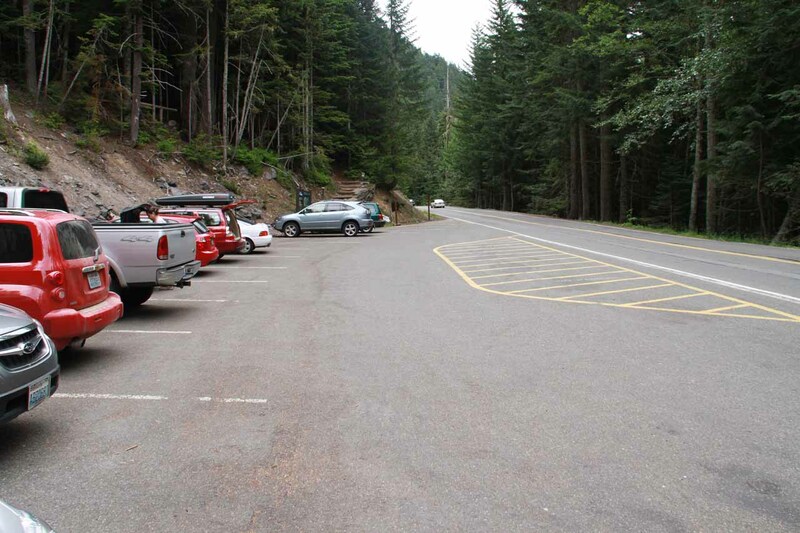 At 9:05am, we were then at the Comet Falls Trailhead, which still was only half full. However, Julie wasn’t finished pumping so it wasn’t until 9:40am when we finally started our hike. And by the time we were good to go, the car park was completely full! It was utterly amazing how fast it filled up, and perhaps even more amazing how close we were to being one of the unfortunate folks marauding the limited car park looking for spots. So Julie and I ascended the stairs just as a large group of seniors were about to start on their hike. About five minutes into the hike, we spent time on the bridge crossing over the creek responsible for Christie Falls. 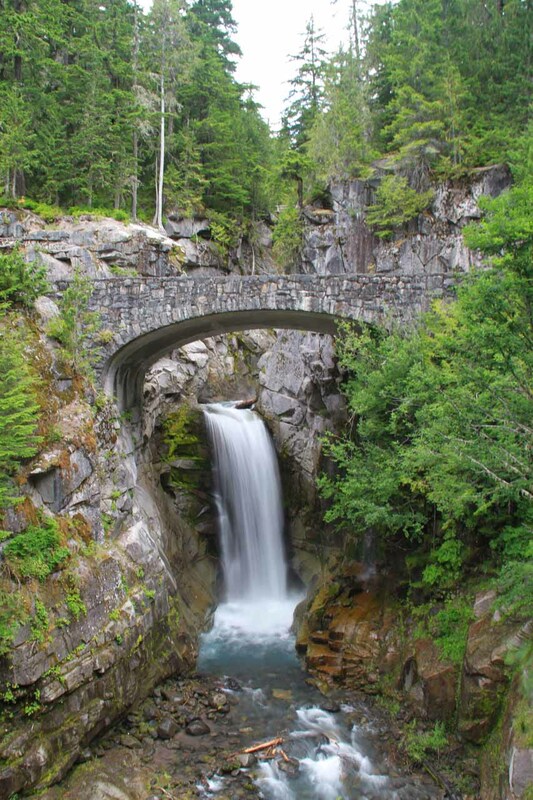 We could even see through the narrow gorge towards the bottom where cars would either slowly pass by or even back up into the pullout adjacent to the bridge in response to seeing this waterfall! 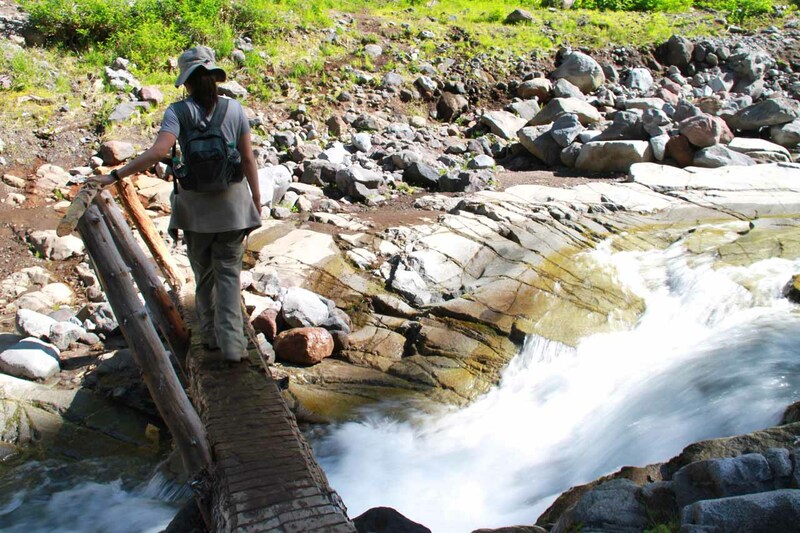 Not long after this bridge, the hike then started to climb. Little did we know just how much climbing was involved. 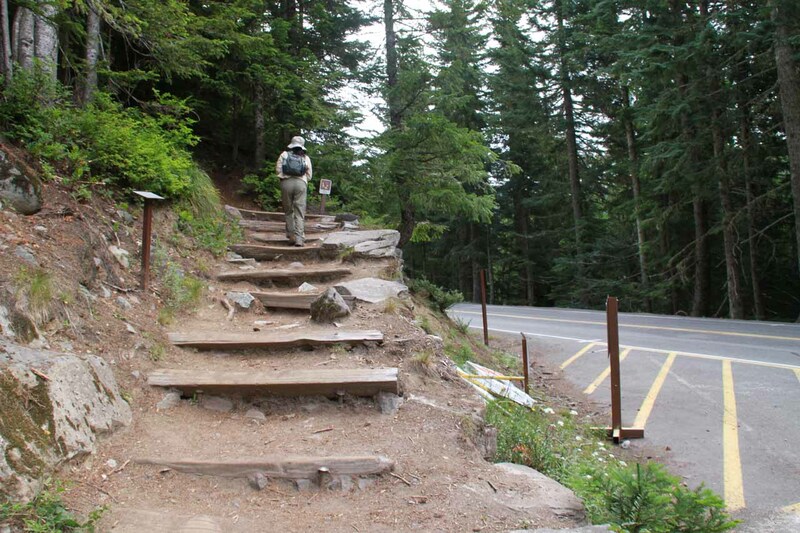 It seemed like there must’ve been at least two dozen switchbacks, and the climb continued relentlessly. There were hardly any breaks in the climb, and just when we thought the climb was about to end, we’d be faced with another daunting uphill with even more switchbacks to face. At 10:20am, we made it to the top of the initial climb. Now, the trail started flattening out somewhat as it hugged the ravine carved out by the same creek responsible for Christie Falls (which I believe was Van Trump Creek). 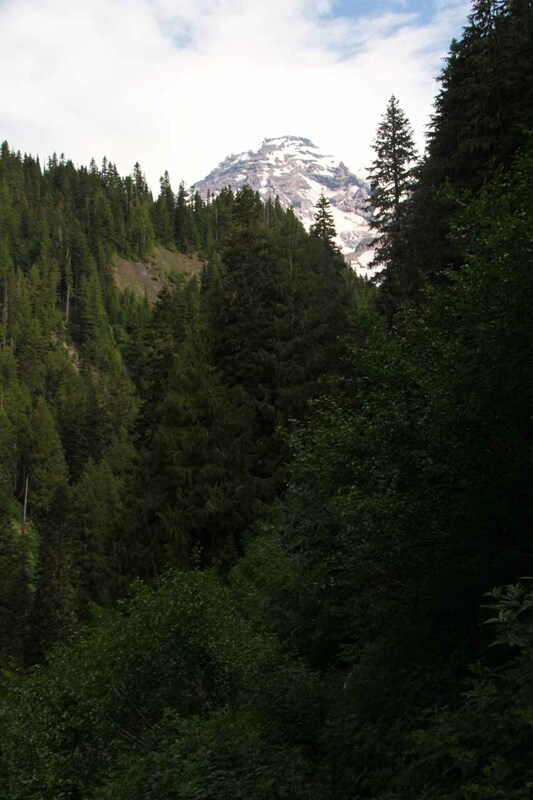 However, we also started to see the top of Mt Rainier from the trail despite the partial morning cloud cover, which looked like it was breaking up as the day went on. 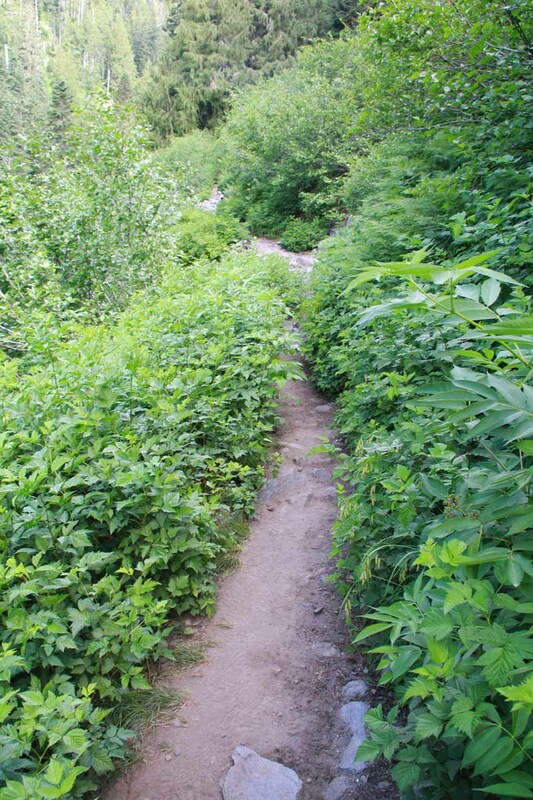 The trail was also narrow and overgrown at this stage. Julie and I weren’t sure if some of the overgrowth was poison ivy or poison oak. Either way, they’re bad news for exposed skin and orifices. So we tried our best to either keep our arms raised when brushing up against the flora or trust long sleeves would do the trick. 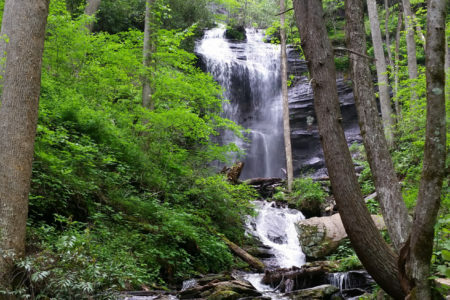 About 15 minutes later, we saw another cascade in the creek alongside the trail. However, this time, the trail started climbing again. Both of us were sweating bullets as the air was still despite the shade from the tree cover. 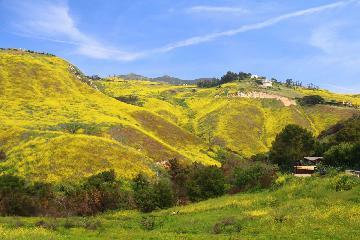 Needless to say, the relentless uphill of the trail was not easy to say the least. 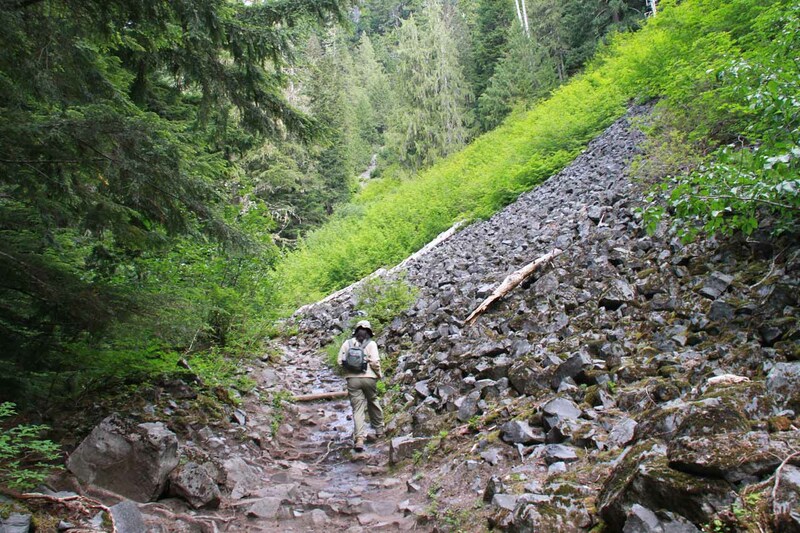 The climb continued for a handful more switchbacks as well as tall steps as we traversed boulder fields of old lava rocks or basalt sloping through the trail before eventually meeting the creek below. 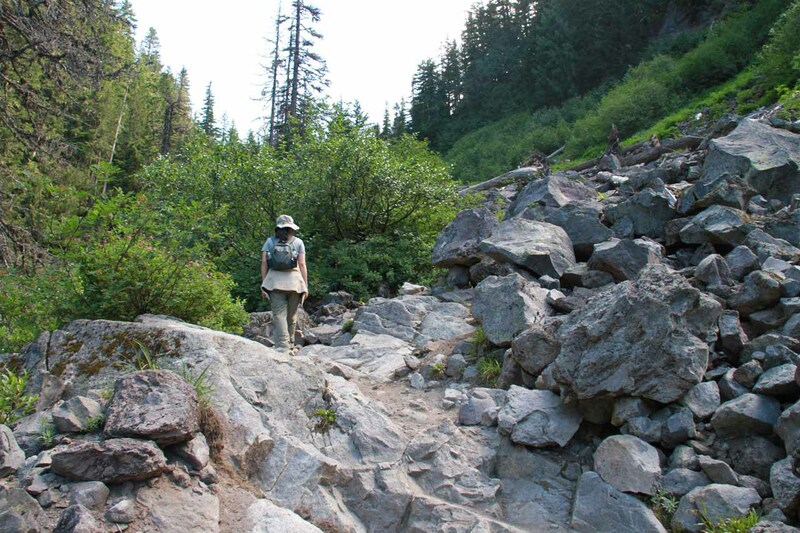 At 10:45am, we saw yet more cascades as the trail finally flattened out again. The cascades were becoming a dime a dozen on that creek at this point. 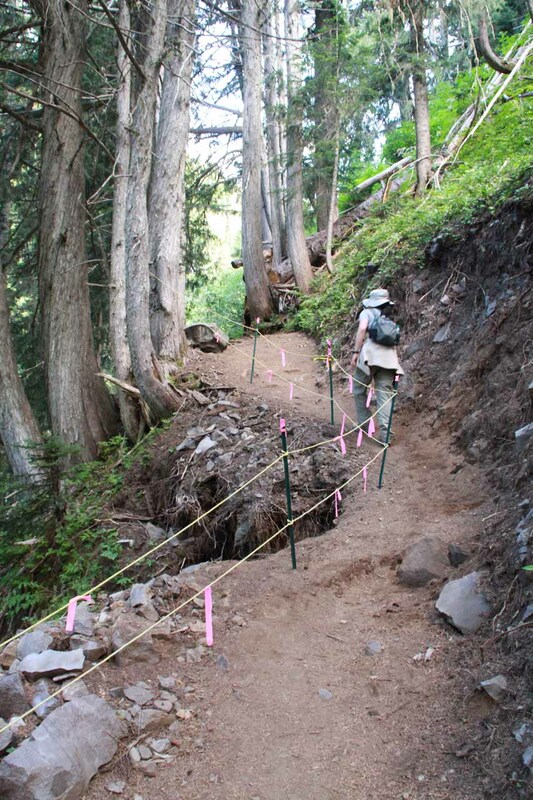 There was one part of the trail where it looked like a large section of it sunk into the ravine below, and this was cordoned off by rope with pink flags. 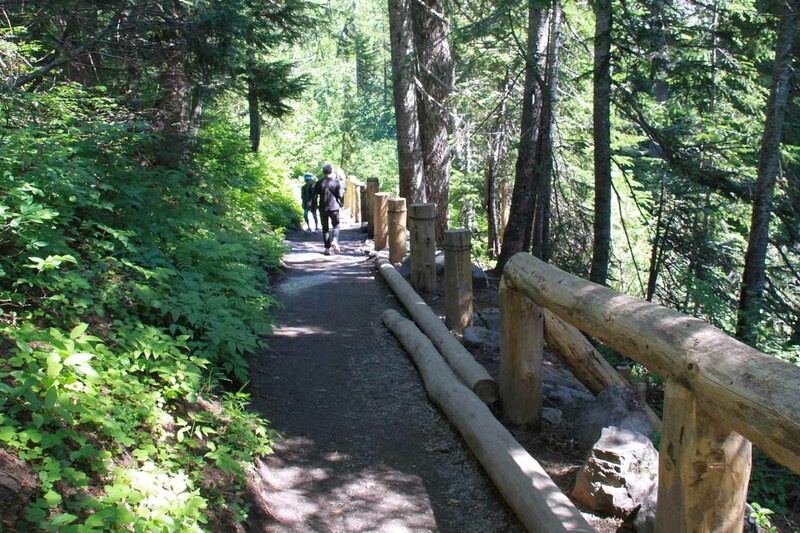 Julie and I wondered how much longer would it be before the rest of the width of the trail would fall in and thereby prevent pedestrian access (what would the park service do then? build a bridge? does the gov’t have money?). Anyways, about five minutes later, we rounded a bend and then we saw a sign indicating with an arrow pointing across the creek saying “Comet Falls 200 feet”. 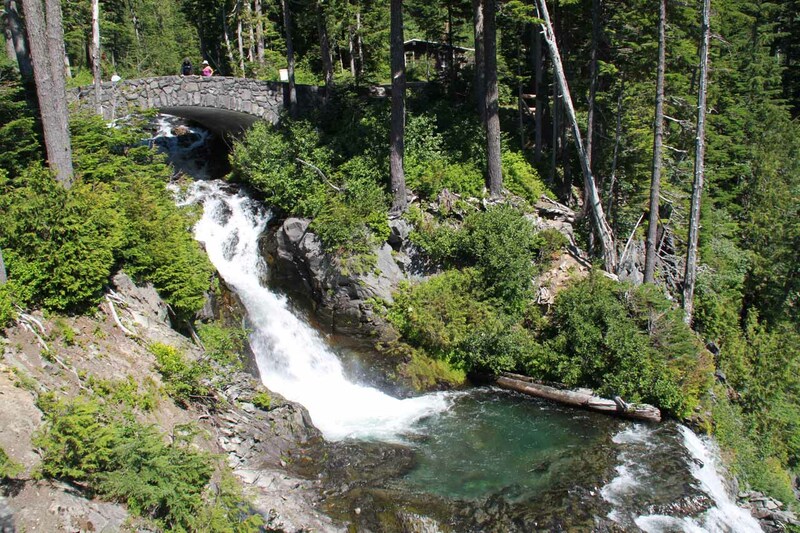 We also noticed a three-tiered cascade spilling into a creek responsible for going under the primitive footbridge we had to cross (again, I believe it was Van Trump Creek and the falls was Van Trump Falls). 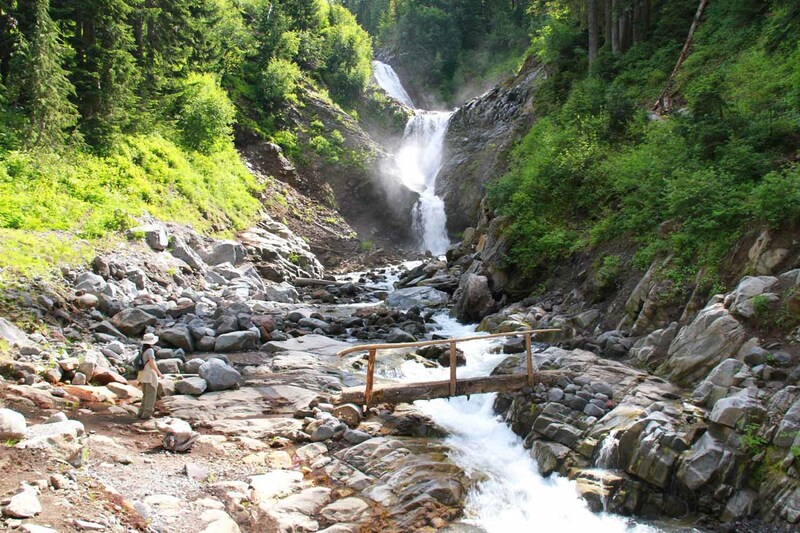 At first Julie thought the three-tiered cascade was Comet Falls, but I knew from prior research that there was no way that could be it. And it was then that the sign that was put there was meant to avoid the confusion between this falls and Comet Falls. Good thing I didn’t listen to Julie in this case. And after another couple minutes of hiking, we finally saw the impressive Comet Falls. 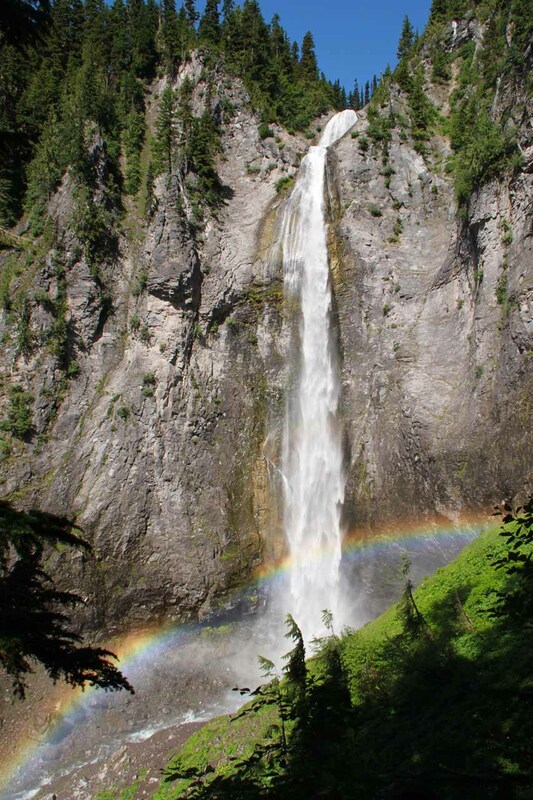 From the initial vantage points, we could see the entire waterfall even though neighboring trees conspired to block the best views. Not satisfied with the views of the falls from this far downstream, we continued alongside to trail to see if there were any other Comet Falls viewpoints. 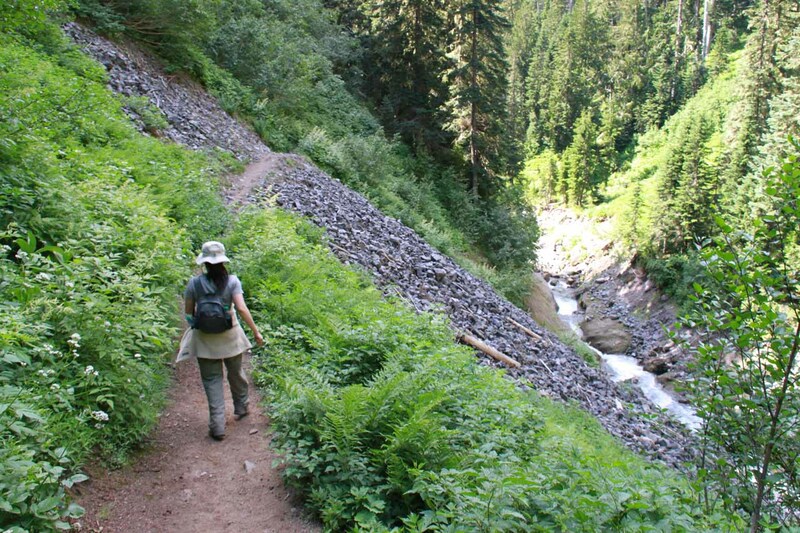 And that was when we noticed there were switchbacks going higher up the trail. Julie followed me for the first few switchbacks as we weren’t sure where this was going. 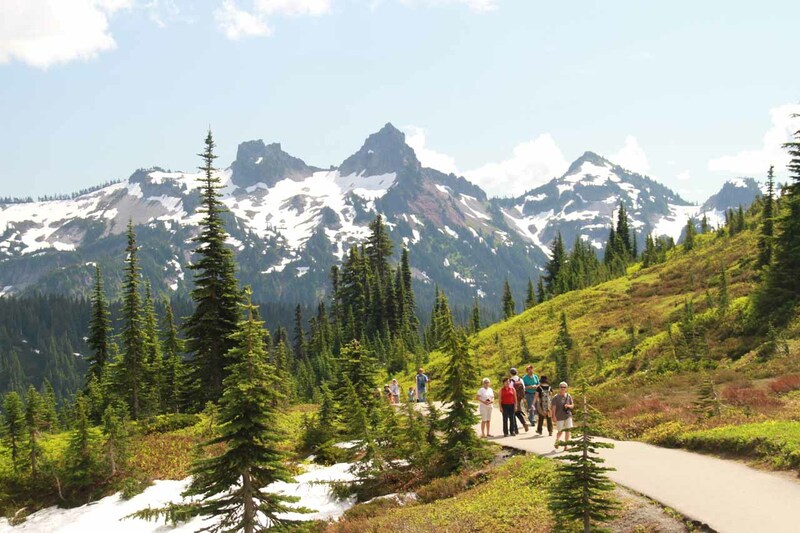 Had we read the signs and the maps, we would’ve realized the trail would keep going to Van Trump Park, which I’d imagine would be like Spray Park – a subalpine meadow with views of Mt Rainier as well as having wildflowers. Anyways, we arrived at a point here there was a spur trail that went almost directly underneath the very tall waterfall. Plus, we were able to see a rainbow in its mist thanks to the morning sun that punched through a clearing in the clouds. The trail then continued some more so I went solo on this part just to pique my curiosity. Well, I expected the trail to end or lead to other views of Comet Falls. 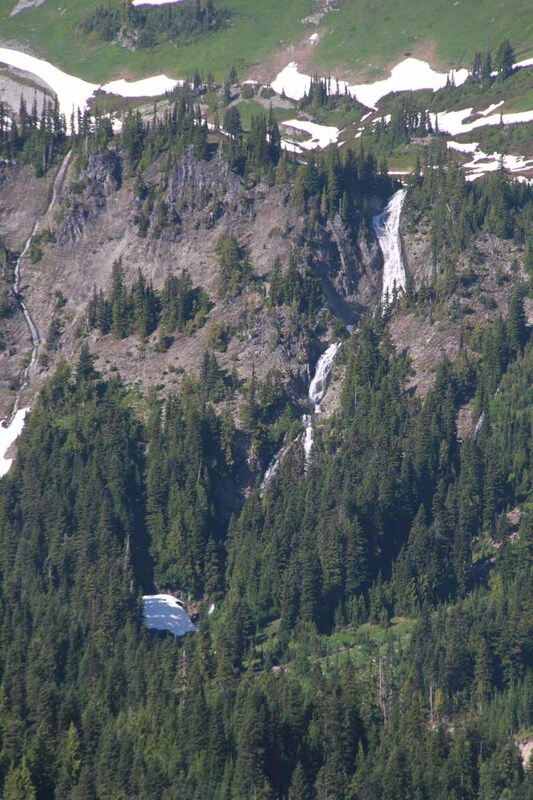 At least I was correct in that there were a couple more impressive views of Comet Falls’ main tier. 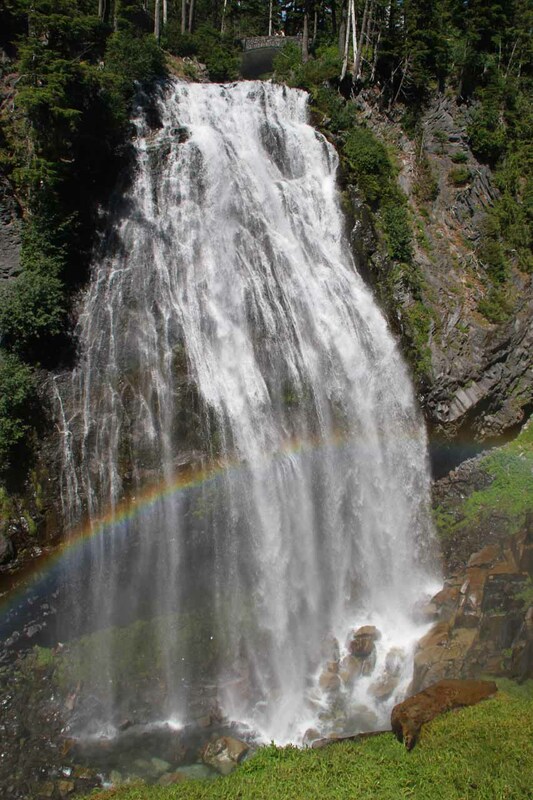 Plus, the rainbow was more prominent at the base of the falls from the higher vantage point. So after taking whatever shots I could, I rejoined Julie who was waiting near the junction with the spur trail leading right into the misty base of the falls. I had had enough of climbing at this point. By that time, the large group of seniors caught up to us. Anyways, Julie and I took some people photos while snacking on fruits that might’ve gotten smushed in my backpack. It wasn’t easy taking photos close to the falls thanks to the mist. Plus, the handful of mosquitoes might’ve gotten pot shots on us without us knowing. When all was said and done we left Comet Falls at 11:45am, which was a bit more time than we expected on the trail. Yet we enjoyed this falls (at least I did since Julie was more partial to wider more powerful ones than the tall ones) and felt we milked this experience as much as we could given our time constraint to see more falls this day. Well at least with all the uphill to get up to the falls, we had an almost all downhill hike to look forward to. Aside from getting a little bit of pounding on the knees and a couple of near slip and falls by Julie (who didn’t trust my advice about going aggressive on the downhills to both preserve momentum and minimize the likelihood of falling backwards from slippage), we made it back to the car park at 12:45pm. It was now much sunnier than it was this morning. Plus the car park was just as crowded as before except now there was a van with someone in it waiting for a spot to open up. And now we were on to continue further into the park to see the other waterfalls we had planned to see. 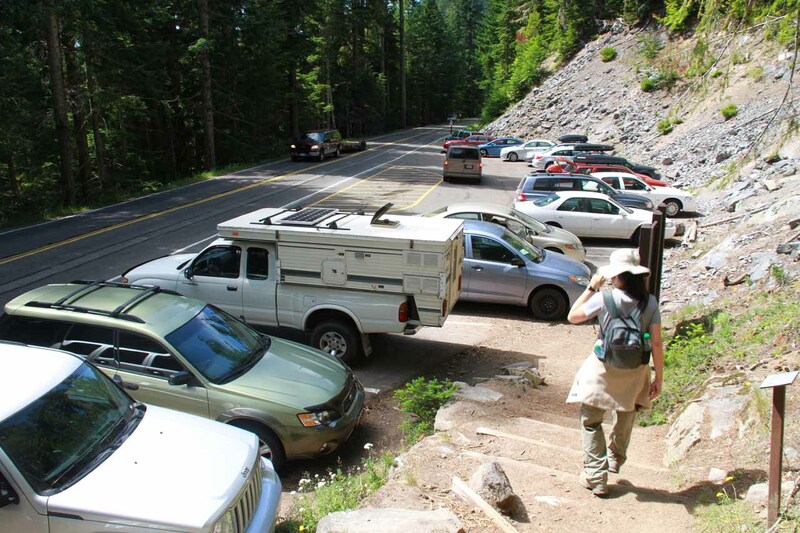 But just before we were gaining momentum to continue towards Narada Falls, which was next on the list, we turned right at a one-way road with lots of crowded lookouts. It turned out that there was a view of Mt Rainier from this spot and so we decided to join them since we knew how fickle volcanic peaks like this tend to attract cloud cover. Well, it was difficult to take good photos of this peak thanks to its wide and rounded nature, but it was still beautiful nonetheless and pictures just didn’t do it justice anyways. We continued on and skipped the remaining pullouts as we returned to the main road (Paradise Road, I believe). I’m sure one of those pullouts was for a waterfall, but we were going for the big fish, and I didn’t think the falls here (Carter and Madcap?) were what we were planning on doing based on Gregory Plumb’s rating system in his book. 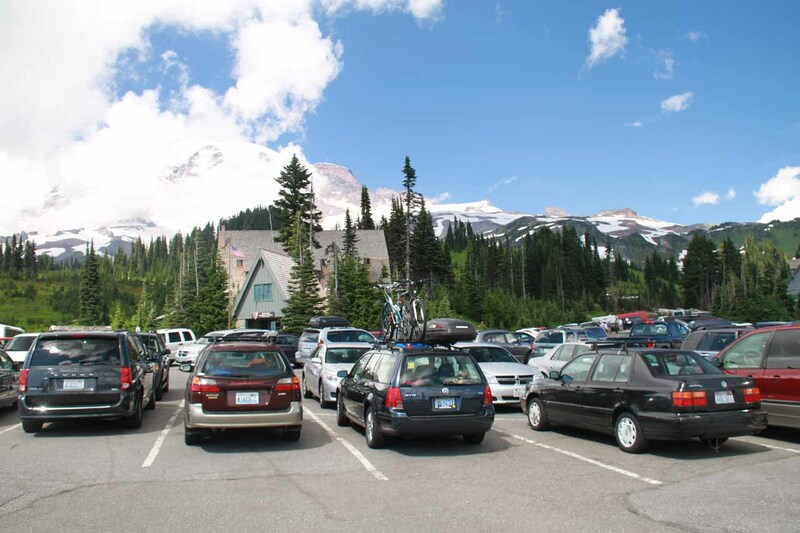 About five minutes after making our 1:05pm stop to view Rainier, we were then at the very busy and huge Narada Falls car park. Actually the car park was spacious, but only parking was allowed on the sides leaving a huge gap in the middle. Still, this particular falls was very popular with lots of people looking from the overlook near the car park as well as many others taking the trail to get in front of the falls. The top view was top down and we could only see the falls’ brink as the water disappeared and produced mist further below. Yet from this vantage point, we could see where the trail went and how small the people looked down there, suggesting it was a steep path to get down there. Julie was still pumping in the car so I went down first. There was a lot of moisture on the viewing area making the footing slippery. There were lots of people trying to take photos with mist blowing their way, and I wondered how one guy’s photo would look with his tripod setup and all that mist blowing right towards the lens. Ah yes, I’ve been there, and done that, and know how terrible photos look with waterspots all over them. The bright side to the misty view was that there was a nice arcing rainbow right across its base. So naturally, I took a lot of time fighting the mist in order to get those rainbow shots. After taking shots from the busy viewing area, I then recalled Yano’s advice about going further down and photographing the falls from the bottom. So I didn’t hesitate to continue down the trail into the packed mud part before it started to dry out. 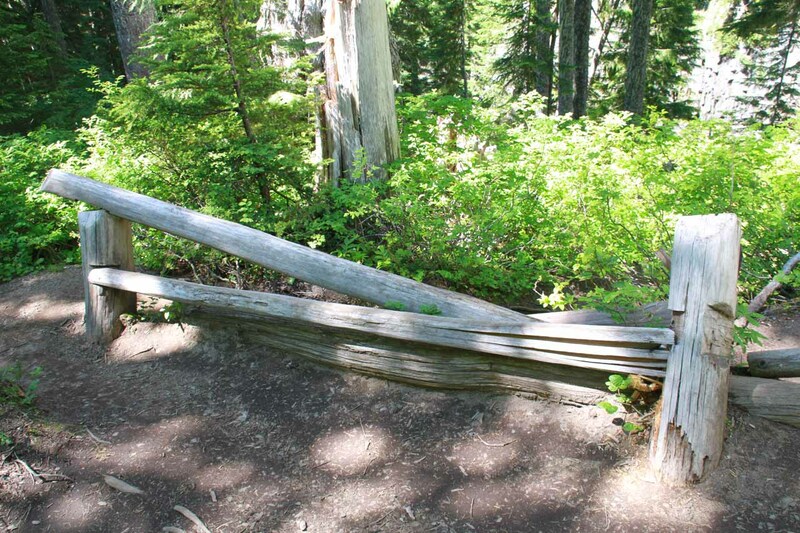 And that was when I saw there was a trail branching off the main one except it was fronted by fallen logs in a configuration that seemed to discourage people from going in. I guess this was another one of those closed former accesses, but this one looked really benign in comparison to the one I saw at Comet Falls. 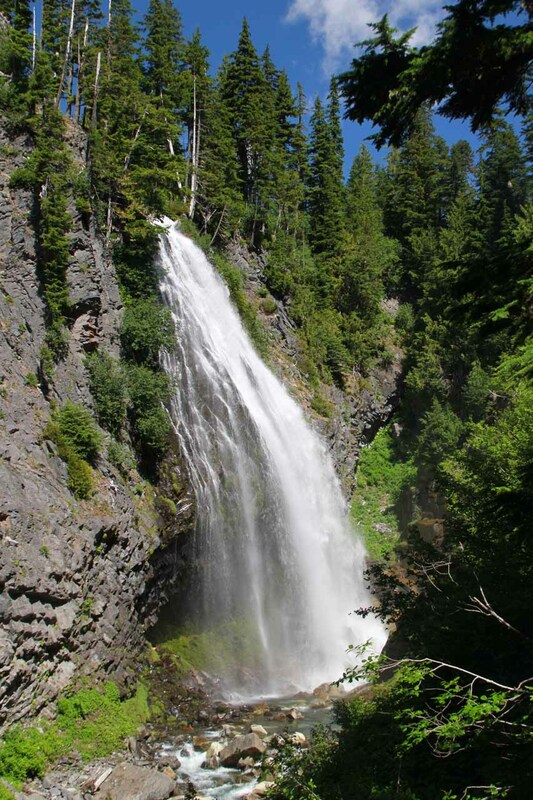 So I went besides the log and followed the path to a fairly open view of the profile of Narada Falls. And without the mist getting in the way, I was able to take shots in long exposure. It was nice and quiet down here, and I wished that I could stay longer in the serenity of Nature. However, I didn’t want to have Julie not knowing where I went plus I’m sure the no-see-ums already got a few bites on me. By now I was sure I must’ve gotten about a half-dozen bites throughout the two days in the park so far. Anyways, back to the main overlook I went. Julie was still not down here so I just chilled as I was waiting for her. And just when I was about to start making my way up the trail, I saw her crossing the bridge up above by the car park. So when she met me down here, we took some people shots as well as allowed Julie to enjoy this waterfall. 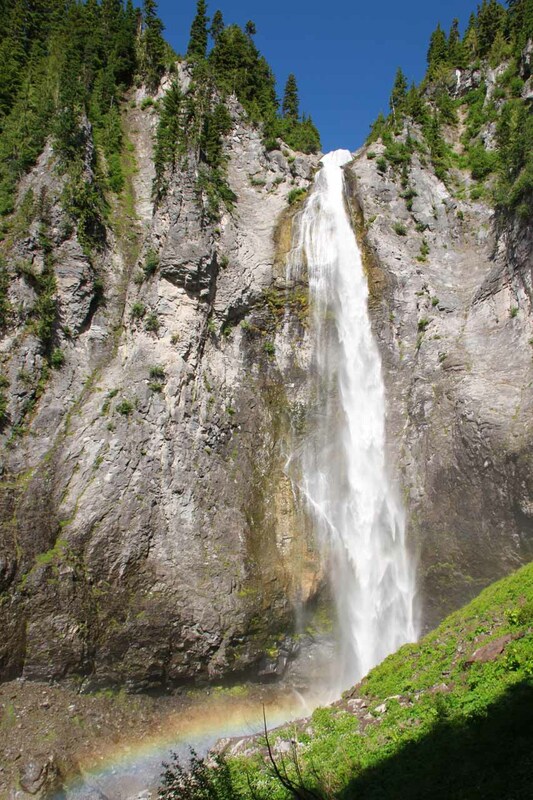 Indeed, this was the type of waterfall that she liked. She said it was better than Comet Falls, and I guess this was one of those things where it was all subjective. Some liked it taller while others liked it wider and powerful. Besides, she probably liked the overall experience of this one as opposed to the long uphill hike where we had to earn our Comet Falls view. It wasn’t until 2pm when we finally returned to the car after the uphill hike to get there. By this time, I was starting to doubt that we’d be back in Seattle before Tahia’s bedtime between 6-7pm. About 15 minutes later, we followed a caravan of cars up to the Paradise area. The driver in front was going very slow and refused to use the pullouts. I guess when you’re in a popular area, you kind of have to put up with people who either didn’t know any better or were just inconsiderate and stubborn about daring people to pass dangerously. Anyways, the lot at Paradise was very full. There were a handful of cars looking for spots. Meanwhile, we decided to chase Myrtle Falls since it looked like a patch of clouds shrouded part of the peak. I didn’t know where we could access Myrtle Falls so we continued past the Paradise car park and onto a one-way road. It turned out that there wasn’t much to see on this one-way road, including a spot to stop for Myrtle Falls. So, we had to make another loop to get back onto Paradise Road and then back into Paradise. It wasn’t until 2:20pm when we finally were able to find a parking spot at Paradise. Julie was starved for a lunch so she went straight into Paradise Inn for some food. 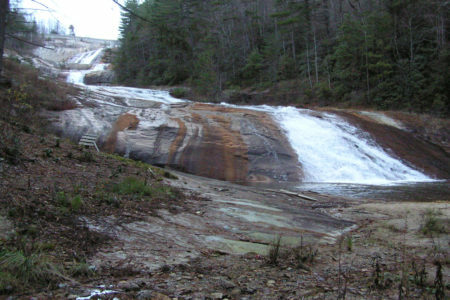 Meanwhile, I headed straight for Myrtle Falls by going up the stairs near the turnaround in front of the inn entrance. Just above the stairs, there was a patch of snow, and since I was in Chacos, the footing was tricky. So onwards I went, but I knew going down on the way back would be a bit more difficult. The trail was all paved as there seemed to be a network of walking paths criss-crossing this way and that. 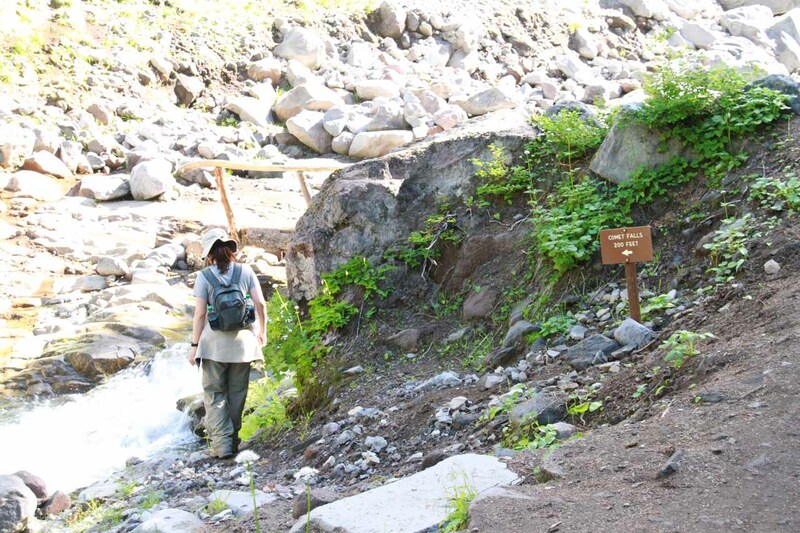 Fortunately, the signposts were clearly marked at each fork, and I knew exactly where the 0.3-mile one-way path to get to Myrtle Falls was at. 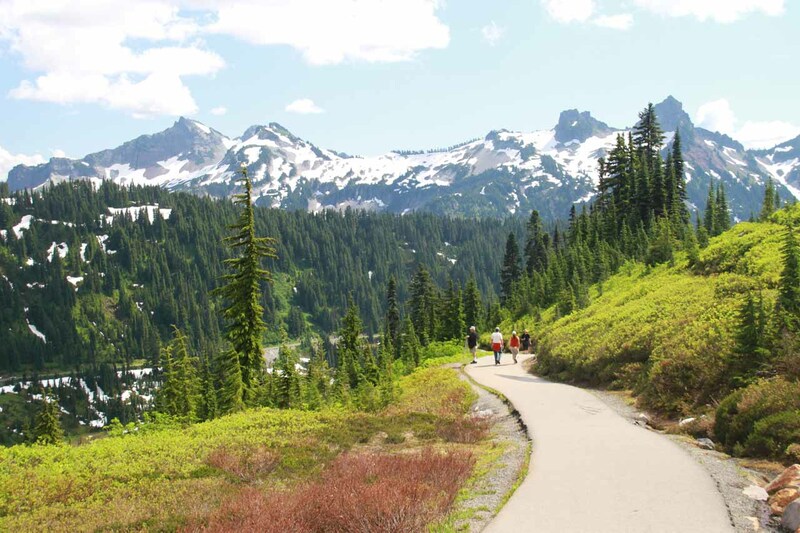 If I wasn’t in such a rush to get the photos then rejoin Julie, I would’ve taken a lot more time on this trail because there were expansive views of not only Mt Rainier but also some other jagged peaks surrounding the area. I was even able to get some attractive photos looking back towards Paradise Inn using those jagged mountains as backdrops. In addition, I was also able to check out the canyon downslope to my right (as I was approaching Myrtle Falls) where the one-way road was. 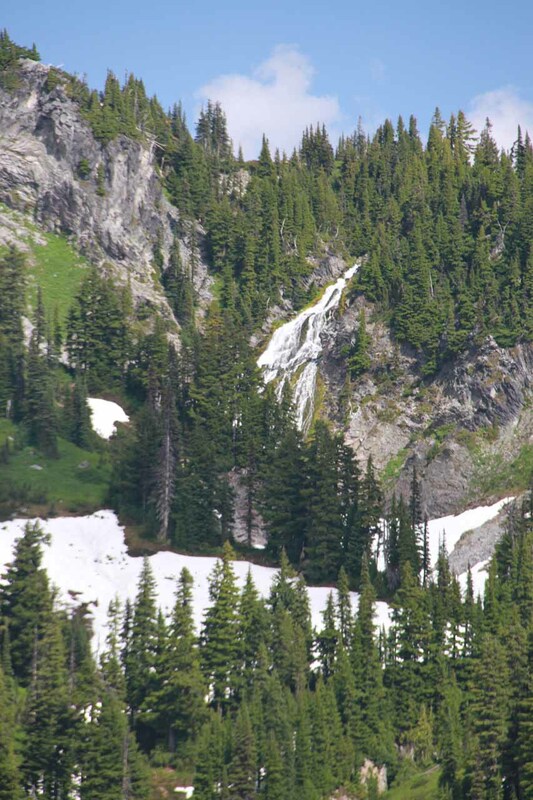 And high up above the canyon on Mt Rainier’s southeast-facing slopes was some tall fan-shaped waterfall, which I believed might have been Sluiskin Falls. 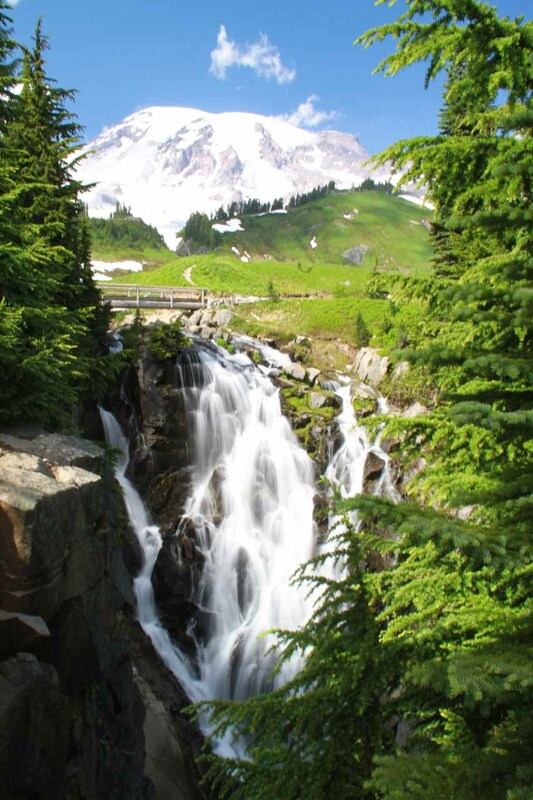 At 2:40pm, I saw the signposted spur leading down some steps to a very crowded (at least for the limited space there) view through an opening of Myrtle Falls fronting Mt Rainier. Fortunately, the clouds didn’t obscure the peak here, and I was in there taking turns with everyone else for that unique photo of a waterfall fronting the state’s most iconic mountain! 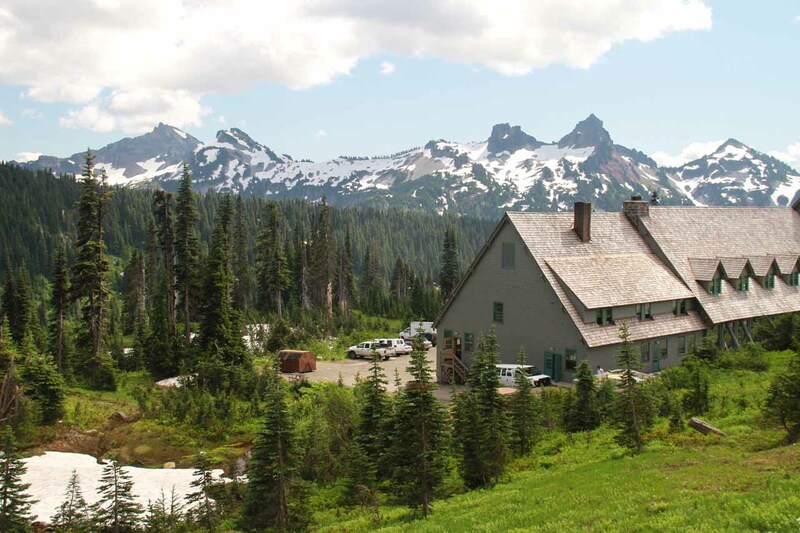 But once I was done with this falls, I quickly made my way back to the Paradise Inn. As anticipated, the snow patch above the stairs was not going allow me to traverse its slippery downhill slope going slow. So I gunned it down with a slight misstep causing a little twist on my left ankle but not all my weight was on that foot, fortunately. So I made it to the inn relatively unscathed. Julie picked up a very dry wrap at the cafe there while she was still waiting on her order for chili. I guess the timing was right because it wasn’t long after I rejoined Julie that the chili she had bought finally arrived. While the sandwich was dry, the chili hit the spot. I wish I could’ve eaten the sandwich together with the chili to offset the dryness. We then spoiled ourselves sharing a soft serve vanilla cone. It was creamy and rich like what I envisioned at that Kalaloch place. So I finally had my indulgent snack to offset the sweat and general sense of being hot on this day. At 3:30pm, we re-entered the car park and left Paradise. We then went south towards the junction with Stevens Canyon Road, where we took that detour and waited out some road construction before continuing on. The last waterfall on today’s checklist was Martha Falls. 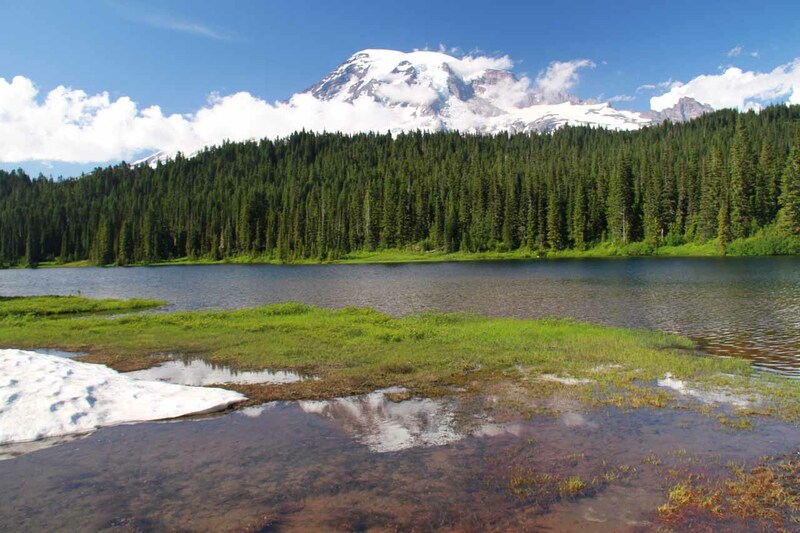 But all along the way, we noticed there were yet more views of Mt Rainier as well as the so-called Reflection Lakes. Then, when the road descended into Stevens Canyon, there were yet more expansive views of the southeast face of the volcano. Once we got around the last major bend traversing Stevens Creek, we found a pair of pullouts on the right side. 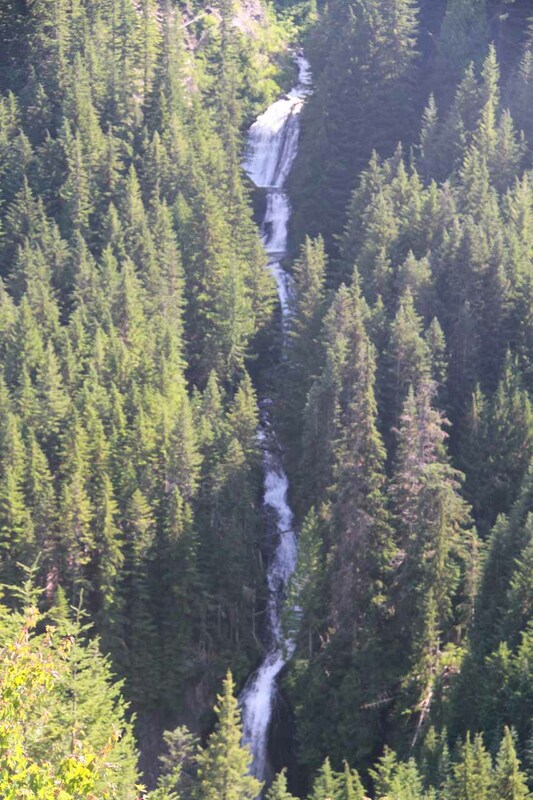 We didn’t notice any signs, but I did notice some cascades down in the canyon as I was slowly driving by. 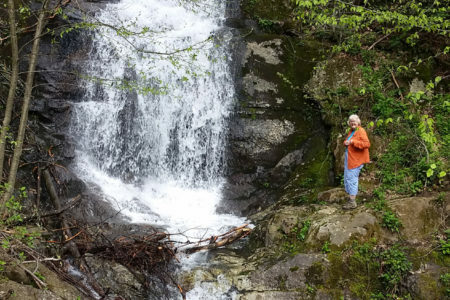 So we stopped at the nearest pullout, then I got out of the car and walked to where I could get views of the upper cascades as well as the main Martha Falls, which I believed pertained to the lowest tier. There wasn’t much of a shoulder on this road, but then again, there wasn’t a whole lot of traffic on this road either. So I didn’t think I was being a road hazard as I was taking photos of Martha Falls and its upper cascades against the sun. At 3:55pm, I was done photographing Martha Falls, but just as I was pulling out and about to use one of the larger pullouts to make a U-turn, I noticed a sign that I believed was for Martha Falls. And sure enough, it was. So I read the sign, took a few more photos of Martha Falls, and then returned to the car. From up here, it wasn’t totally satisfying to experience the falls from this distance, but it was late in the day (we still had to return to Seattle) and I definitely wasn’t about to hike all the way down there (I could see the trail from up here) and then return all the way back up. I was merely content to say we checked off Martha Falls. 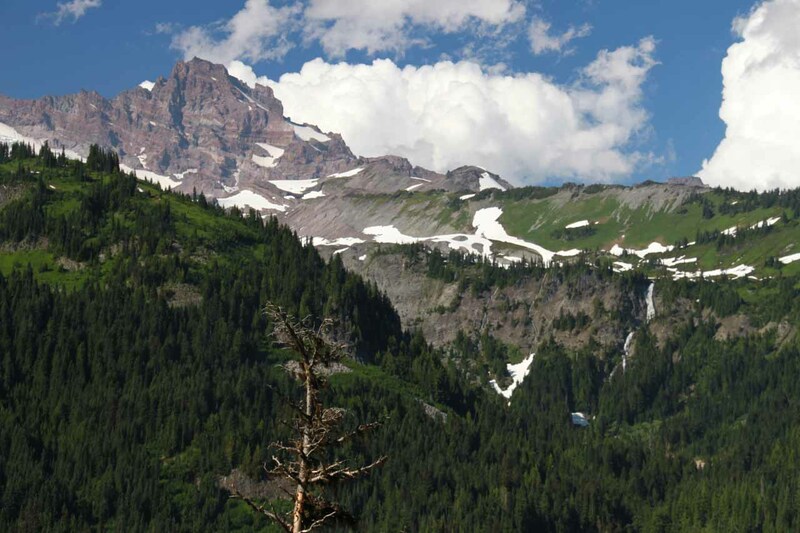 On the way back towards Paradise Road, we made a brief stop at 4:05pm at the hairpin turn providing a view of Mt Rainier. Somehow the photos just didn’t do it justice here. Five minutes later, I noticed some two-tiered waterfall in the distance, and according to the map, I believe that was Fairy Falls. Then at 4:15pm, we joined a large group of people just chilling before the Reflection Lakes. But at this time of day, the lakes were rippling and so was the smaller pond further east. So there were no reflections on the main bodies of water per se, but I did find a calm section of water adjacent to the lakes where a snow patch melted into a pond. With what limited reflections of Rainier’s peak was available in that small patch of calm water, I got my shots and then continued driving back towards the Nisqually Entrance leaving the lakes at 4:30pm. 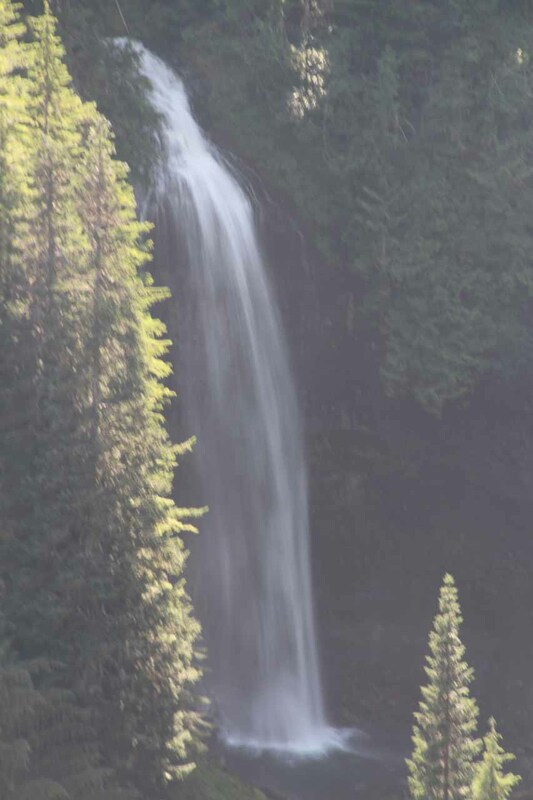 At 4:40pm, we returned to the Christine Falls pullout where we made one last stop there so Julie could finally see what it was like (she was pumping earlier in the morning when I was here). I also got to take a movie since I thought I had forgotten to take one from this spot. Finally at 4:50pm, we left Christine Falls and officially were on our way to leave the park for good. Once again, we had to follow some inconsiderate drivers refusing to use pullouts, but we ultimately got into the South Hills or Puyallup suburbs around 6:10pm where we found a Target to re-stock on water and other things in preparation for the rest of our stay in Seattle and then the cruise to Alaska next week. Mt Rainier could be seen barely above the roof of the Target here, and it was quite gorgeous in the afternoon, especially with nary a cloud except some thin streaky ones still above it. Too bad it wasn’t photographable from here. Otherwise, I could’ve killed the time Julie spent shopping to take photos. We finally left the Target at 6:35pm (though without produce as this target seemed to be recently opened). But just as we were about to leave for Seattle, Julie noticed a Safeway and made me stop there for our produce. There also happened to be a gas station there so I went ahead and filled up while Julie was grocery shopping. Finally at 7pm, we left the Safeway, but then she asked if we should stop at some local Thai place here. But since I was itching to get back to Seattle, I wasn’t too keen on spending another hour here in Puyallup or South Hills (don’t know which suburb we were in). Puyallup seemed to me to be a place name that brought me back to WA (Western Australia, that is!) where all its place names had an “up” at the end like Beedelup, Torndirrup, Wallingup, etc. I didn’t know if Puyallup happened to be a coincidence or if there really was some language similarity here between Native Americans and Aborigines. 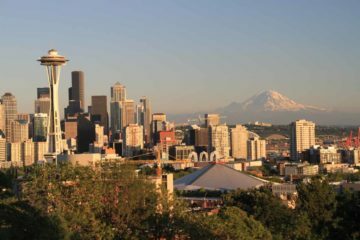 During the drive back, we could once again see Mt Rainier rising above the suburbs and foothills with an afternoon glow. It was too bad that it seemed like the views from the 167 and the I-5 were one of the best at getting such photos, but who’s going to pullover a freeway shoulder to take photos of the mountain? I figured if locals took this view for granted, I’d do the same. Besides, it wasn’t worth becoming freeway roadkill over it. Julie and I were also chatting this entire drive. One of the topics that came up was whether she enjoyed this day. She said she did, but she also felt like we were ticking off a checklist. And she was right, because a day trip from Seattle made the experience a bit rushed where we had to be as efficient as we could with our time. I’m sure if we were more flexible (i.e. 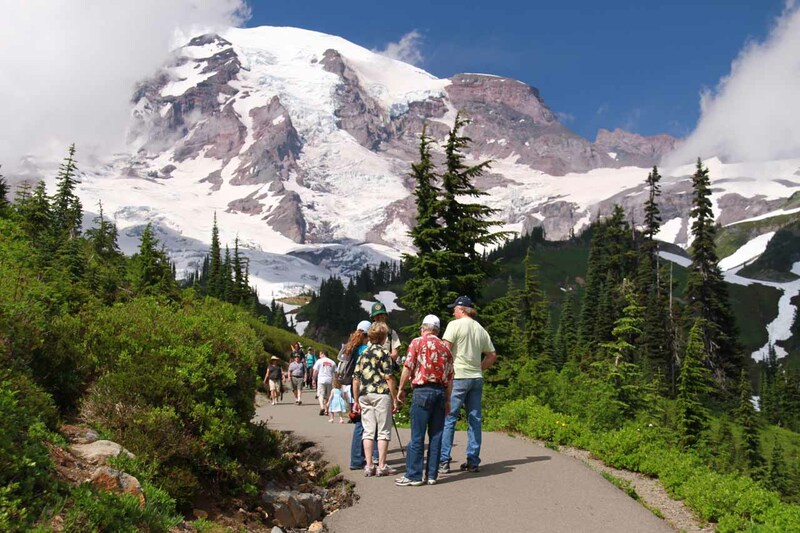 without an infant and elder), we could’ve stayed in the park and explored other parts like the Sunrise side as well as the Ohanapecosh side of Mt Rainier. I guess that’ll have to wait for another time. At 7:55pm, we were finally back in downtown Seattle. Not surprisingly, Tahia was asleep (in her stroller as opposed to her pea pod!) and Julie’s mom had bought us some takeaway Vietnamese food during her time spent with her relatives throughout the day. I guess that saved us more time and money, and so ended this very eventful day where the rest of our stay in Seattle would be more subdued.